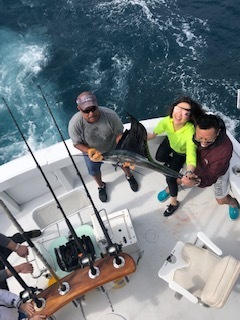 Nancy and her friends from Chicago chartered the Top Shot Sportfishing charter boat team to do some deep-sea charter boat sport fishing in Fort Lauderdale, FL. Nancy was enjoying the Fort Lauderdale South Florida chamber of commerce weather here after leaving Chicago’s cold weather. Fifteen to twenty minutes after leaving the dock, lines were in 120 ft. of water at the sea buoy in Fort Lauderdale, 1.8 miles from shore. As we venture off another ¼ of a mile you will find yourself in 500 ft. of water due Ft. Lauderdale’s extreme drop off. We started the charter trolling the reef using two planners, one a #8 and the other a #6, both with sea witches in front of a double hooked Bonita strip. For surface baits, we had four Mullet strips. We trolled the reef line, zig-zagging in and out from 80 ft. of water out to 200 ft. Our first fish was a Kingfish on one of the planner rods. As we kept picking away at the fish north of Fort Lauderdale, a color change was moving in. I trolled out to the color change and then took it south of Fort Lauderdale. With a couple of missed fish, we finally connected. Sailfish on the right long! Back and forth with bill out of the water swatting at the bait �" hooked up! �" the Sailfish came out of the water and tail-walked, showing his magnificent neon colors as the sun shone on him. After a 15 minute battle, Nancy reeled the Sailfish to the side of the boat where our mate, Dave, grabbed a hold of the leader. Pictures were taken and the Sailfish was released to fight again. With a total of 1 Sailfish, 1 Kingfish, and 2 Black Fin Tunas, it was time to head back to the dock. The anglers retired into the a/c salon and enjoyed the relaxing trip back to the dock at Bahia Bar Yachting Center, 801 Seabreeze Blvd. Fort Lauderdale 33316. At the dock, Dave filet the fish out for Nancy to take home and enjoy.